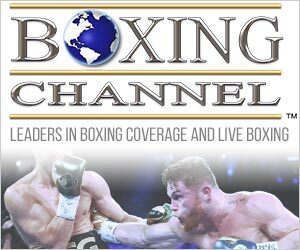 You might think that the 20th anniversary of the winning of his first world championship would be a cause of celebration for Bernard Hopkins, or at least a reason for fond remembrance. Such an assumption would be incorrect. For all his accomplishments, Hopkins, 50, is more of a forward-thinker than a looking-past type. He might or might not have one more fight to squeeze out of his career as an active fighter, but in either case he’s prepared for the next phase of a most interesting life, which the reformed ex-con envisions as a color commentator for televised boxing, a celebrity endorser, a more fully involved executive with Golden Boy Promotions or, who knows, maybe the host of a network news/entertainment show. During an hour-long discussion of what was, what is and what is yet to be, the oldest fighter ever to win a widely recognized world title made it clear that his final bout, whether it is against an undetermined opponent sometime this year or his unanimous-decision loss to Sergey Kovalev in their light heavyweight unification showdown last Nov. 8 in Atlantic City Boardwalk Hall, is not the end of Bernard Hopkins. It only marks a new beginning. And if no credible opponent signs up for B-Hop’s farewell to the ring wars, after 27 years in the pro ranks? For many champions, retirement means taking it easy, maybe eating some of the fattening food that they had to deny themselves to remain in fighting trim, and to become fixtures at card shows and other gatherings where nostalgic fans can gaze upon them and recall just how proficient they once were in the toughest, most demanding sport of all. Hopkins doesn’t intend to settle into the comfortable if somewhat dissatisfying existence of an official relic. After being a guest presenter at the 90th annual Boxing Writers Association of America Awards Dinner in New York on April 24, and then taking in the Wladimir Klitschko-Bryant Jennings heavyweight title bout in Madison Square Garden the following night, he jetted to Las Vegas the next day to serve as an expert commentator for ESPN’s week-long coverage of the Mayweather-Pacquiao megafight, which comes on the heels of what he hopes was the first of many similar gigs with HBO Sports, having been a part of the broadcast team for the March 14 Kovalev-Jean Pascal fight in Montreal along with Jim Lampley and Max Kellerman. And while he is still learning a few tricks of that trade, like shortening his trademark 10-minute soliloquies, as entertaining as they might be, to more easily digestible 10-second sound bites. As an interviewee instead of as an interviewer, B-Hop can still go the distance, rattling off lengthy responses to questions about, well, just about anything. 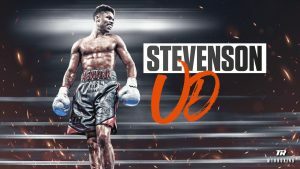 For the purposes of this story, the subject was his first world championship victory, in his third shot at a title, when he won the vacant IBF middleweight belt on a seventh-round stoppage of Ecuador’s Segundo Mercado on April 29, 1995, in Landover, Md. But, somewhat oddly, Hopkins’ recollections of that fateful, life-altering encounter were not on the tip of his always-wagging tongue. 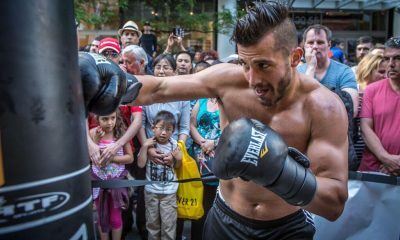 Perhaps, if you’re the veteran of 28 world title bouts, including 21 during his 10-year reign as a middleweight champion, it’s easy to tuck one such fight into the dustier recesses of memory. Or it just might be that Hopkins has sharper, more vivid recollections of his first two title scrums, which came up short. It nagged him that he had to wait 17 years to get a rematch with Roy Jones Jr., who won a unanimous decision for the vacant IBF middleweight crown on May 22, 1993. That festering wound was finally cleansed when Hopkins outpointed Jones on all the judges’ scorecards in a non-title, light heavyweight matchup on April 3, 2010. And it is the first scrap with Mercado, a descendant of African slaves, that Hopkins is forever apt to recall, and none too fondly. 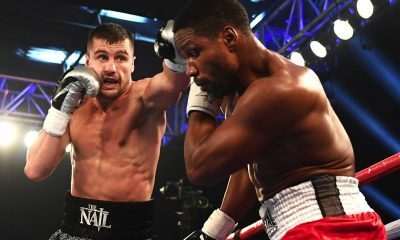 Again fighting for the vacant IBF middleweight championship, Jones having moved up to super middleweight, Hopkins seemingly was being dealt from a stacked deck, although he was ranked No. 1 by the IBF to No. 2 for Mercado. Not only was he going up against an Ecuadorean in his home country, but the lead promoter for the fight was Don King, who had Mercado, a Quito resident who presumably was accustomed to that city’s thin air at an elevation of 9,252 feet. 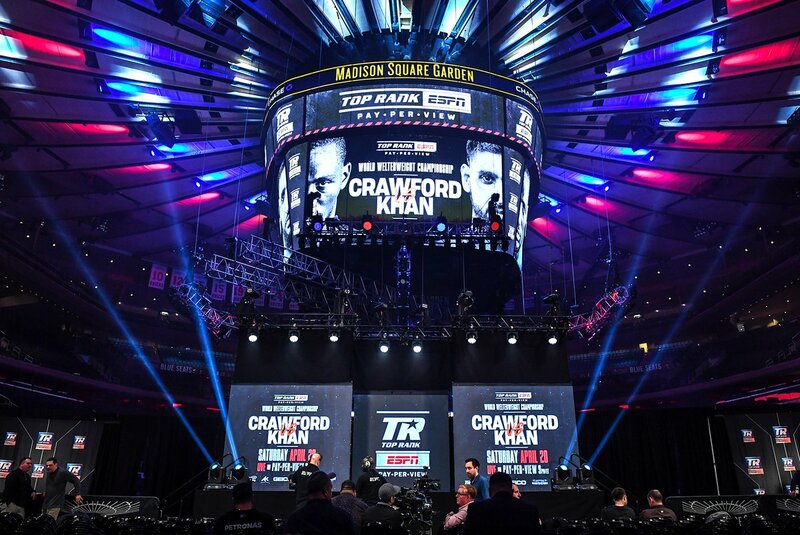 Hopkins, on the other hand, was brought in just two days before the bout (as he remembers it today) or four days before (the time line described by the Showtime broadcast crew). In either case, that was hardly enough time for Hopkins’ body to adjust to the stark change in altitude. “Oh, man, that whole trip was something else,” Hopkins said. “There was a war or something going on between Ecuador and Peru. Everywhere you went, there were a lot of soldiers carrying submachine guns. 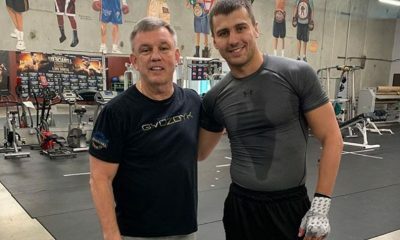 “After we arrived, I ran into (future WBA super middleweight champion) Frankie Liles and he said, `You just coming in?’ This was Thursday, two days before my fight with Mercado. I said yeah. He told me he and some of the other fighters from America had been there for, like, two weeks, to get adjusted to the altitude. So why did Hopkins arrive in Quito with so little time for get acclimated? 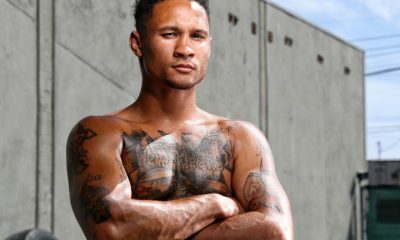 He said he has “documentation” that Lewis, from whom he later split, had been given $100,000 by King to delay his departure for Ecuador and thus further enhance Mercado’s chances to become the first professional boxer from his country to win a world championship. What a gasping Hopkins, who was floored in the fifth and seventh rounds, needed was a second wind. 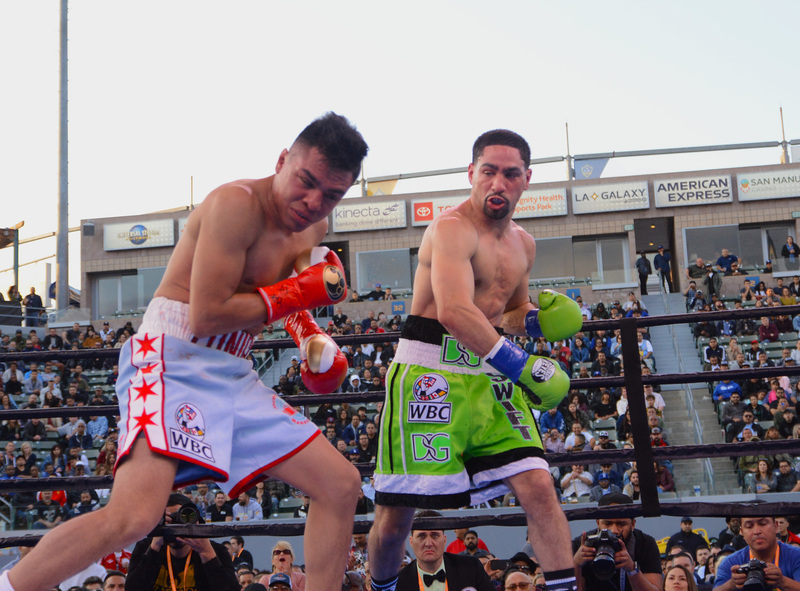 Somehow he found it, dominating the closing rounds as it was Mercado who appeared to tire more down the stretch. 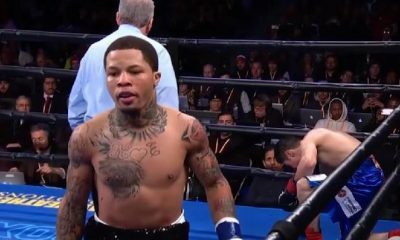 When it was all over, the IBF title remained vacant, Hopkins coming out ahead, 114-111, on Al DeVito’s card while Colombia’s Francisco Hernandez had Mercado winning by 116-114. That left matters up to the swing judge, Paul Gibbs, who submitted a scorecard all even at 113-113. The IBF-mandated rematch took place just 133 days later, at sea level and on American soil. 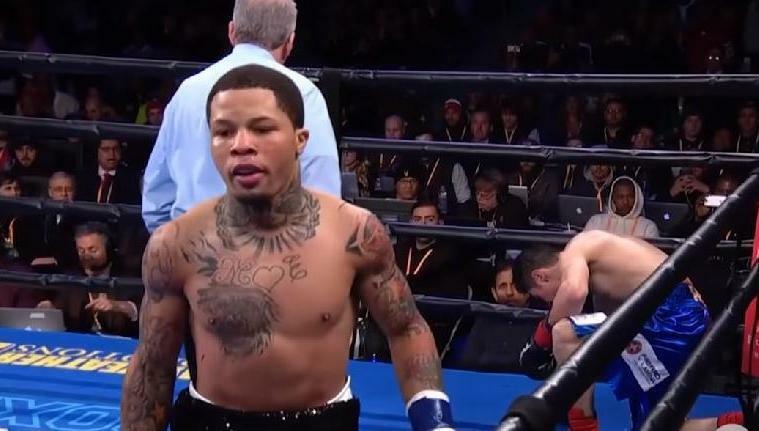 The atmospheric change and a supportive audience must have energized Hopkins, who brutalized Mercado from the opening bell until referee Rudy Battle stepped in to wave a halt to the one-sided proceedings with 1 minute, 10 seconds remaining in the seventh round. As for Mercado, the thrashing he received in Landover – Hopkins still was “The Executioner” then, 20 of his 27 victories coming inside the distance, including 12 in the first round – ruined him. He was 1-7-1 thereafter until his retirement in 2003, with six of the losses by knockout. I asked Hopkins what might have happened had Mercado gotten the nod in their first fight, or if he had fought a Mexican for a WBC belt in Mexico or Las Vegas instead of an Ecuadorean for an IBF belt in Ecuador. 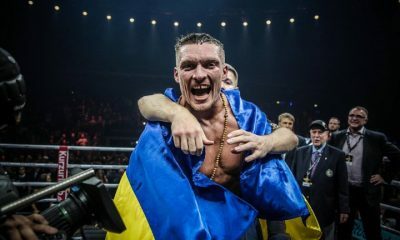 Boxing politics being what they are, it is not unreasonable to presume that he would have had to wait longer, perhaps even a great deal longer, to get another shot at a world championship. Maybe he would never have gotten that opportunity to become what he became. As champion, Hopkins reinvented himself. 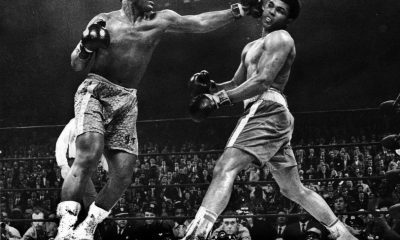 With an eye toward the longevity he was to achieve, he honed the hit-and-don’t-get-hit style that has enabled him to remain at or near the top longer than any elite fighter, and that includes Archie Moore and George Foreman. He makes no apologies for the makeover that some have labeled as exciting as watching paint dry. “Yeah, I heard how I was boring, how I was a technician,” Hopkins said. “Some of it hurt. 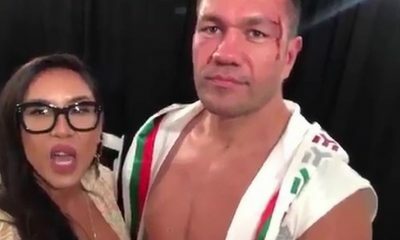 Fighters believe that the only way to be a superstar is to be `TV-friendly’ or `fan-friendly.’ If you’re hitting and not getting hit back much, you’re perceived as not being marketable. But I came to realize I had great defense and great reflexes. I could make a guy miss and make him pay. The thing is, you can do all that and still look pretty good doing it, and against real fighters. So the onetime “Executioner,” more recently re-labeled as “The Alien,” is morphing into “The Elocutioner.” His diction might not be velvety smooth or his grammar always perfect, but he doesn’t slur his words or demonstrate any signs of a damaged brain. Those are the foremost prerequisites for someone who is eager to continue making a good living by talking. Hopkins’ late mother, Shirley, once thought her son’s chattiness might lead him to become a preacher or a politician, and B-Hop said his first dream was to become a disc jockey on the radio.